How can countries work with talent attraction? Have you ever considered working in Finland? Perhaps no – or not yet! Finland has been considering offering you, an international a rewarding working experience and enjoyable life quality. It’s not that the Nokia and Angry Birds producing country hasn’t got the talent – they are most likely hired or starting-up. This Nordic country is need for highly-skilled talent like its Nordic and European peers. ICT, engineers, life-science, marketing talent – there are many sectors whose growth is or will be hampered due to lack of right skills. But unlike many other countries, Finland is doing something about fixing its talent needs, called Talent Boost. It is a national programme initiated and co-ordinated by the Ministry of Economic Affairs and Employment, carried out as a joint cross-sectoral programme within the government. Its aim is to raise awareness of Finland and make it more attractive to international talents. Other aims include harnessing the expertise of international talents who already are in Finland to support the growth, internationalisation and innovation activities of Finnish companies. How to work with talents on a national level? 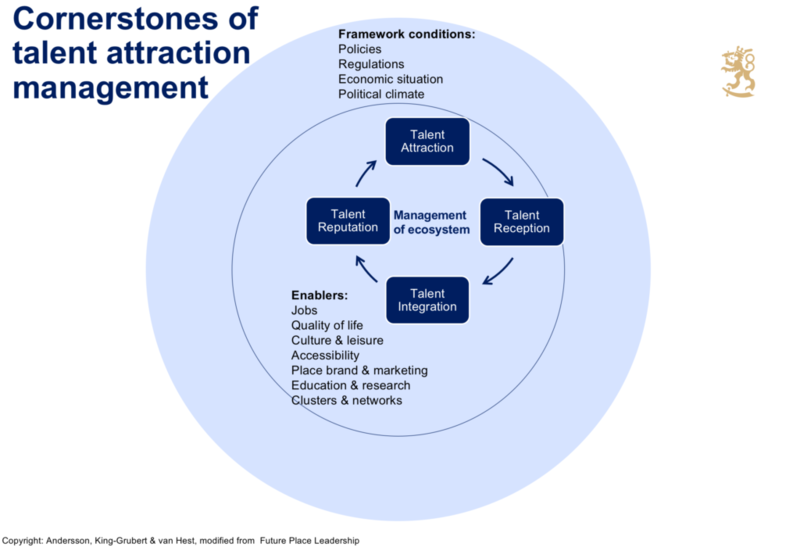 Talent Boost and the governmental talent work is based on among others things the Talent Attraction Management model by Future Place Leadership (see illustration). During several years we have applied this approach to cities, towns and regions. We are immensely proud to see the Finnish government using our model. Figure: The Talent Attraction Management model in practise in Finland. Courtesy of Ministry of Economic Affairs and Employment of Finland. We strongly encourage to learn how the Talent Boost programme has been set up and monitor the upcoming events that they have. The Talent Attraction Management model itself can be applied in any scale. It is a structure to manage a multiple stakeholder environment in sustained long-term push for leading change and orchestrating the ecosystem in a way that results concrete talent services by different parties. Read more about how to work with the Talent Attraction Management model here. Download our free handbook Talent Beyond Capitals to learn about examples and tools how to attract and retain talent in non-capital cities. To learn more about successful and innovative strategies for Talent Attraction Management and how to use it, check out book “Innovation Talent Attraction: A practitioner’s guide for Cities, Regions and Countries”. Read about the Talent Boost programme.